Dragon Racer is a board game I designed and produced with my startup Thylacine Games. 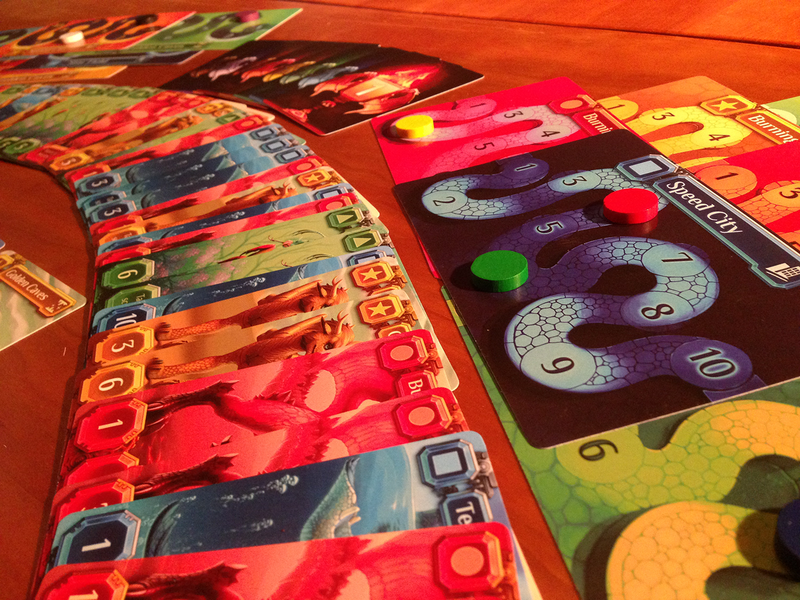 Dragon Racer is a card game for 2-8 players that plays for 45-90 minutes. I raised $10,000 of initial funding for the project by winning a Business Development Grant from the Innovation ACT Business Planning Competition in 2012. This funding was used to develop the game and to bring the artistic talent of Rose Hammer onto the project. In 2014 we ran a Kickstarter project for the game and raised $23,388 from 501 backers. The game is now on track for production in China and is expected to reach retail stores in August 2015. Dragon Racer has received a large amount of praise from board game critics as well as being featured on Australian National News. The Kickstarter campaign was also well received by the community, being described as an “excellent example of [a] visually compelling project page” (Stonemaire Games) and being awarded the project of the week award from Meeple Mechanic’s Kickstarter Badger. From this list the next step was to think about what parts of the card are important for what phases of the game. During ‘drafting’ players hold the cards in their hand, meaning only the top (and particularly top-left) of the card will be easily visible. For that reason the card type and track type were placed at the top of the card. In contrast, the Dragon Speed and Support cost were important during scoring when cards were laid out – these logically worked better at the bottom of the card, allowing supporting dragons to be placed below them with a clear visual connection. Finally the Dragon Name and Level/Letter were placed in a smaller font above the Support cost. This meant they were easily visible but didn’t distract from the more important information. Another important challenge was to ensure that the game was easily accessible for people with sight impairments. Our approach was to ensure that all colors were clearly associated with shapes, so that the game could be played in black and white if necessary. By clearly working through the card design in terms of functionality we were able to build a design that played more easily. This was verified through countless sessions of play testing. A/B testing was done on different sizes for font/icon placement before we settled on a final design.